Be patient with this first game that I made in GameMaker Studio. It is possibly the worst 2D game in the world but I hope it may be a good discussion point for students who know nothing about GameMaker Studio or students who want to be critical of a 2D game in general. Total Propaganda is my first modification of “Catch the Clown”, a demo that comes with GameMaker Studio, which has a free for download version and is a software widely used in education settings to introduce students to making simple 2D games. If you want to learn about it go to https://www.yoyogames.com/ and complete some tutorials. I kept all the sounds and events the same but modified the sprites for background and objects and added a couple more “brick” obstacles inside the main box to make it a little harder. The game concept is rather simple – this is how it feels to live within a total propaganda system, with very few options to move and feeling trapped. 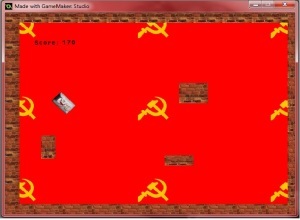 The game uses a simple rewards system where the score increases when you avoid the brick walls. The procedural rhetoric could not be more boring – right click on player sprite to avoid hitting objects, once you stop following the main game object, the game stops. Feeling frustrated already? If not yet, download it and play it. These scrolling shooters are modifications of parts 1 and 2 of two more demos available with GameMakerStudio. I’ve included them here to be able to discuss with students how easy it is in fact to hack an existing game and change the sprites, background and objects to make it feel your own. In addition, they can work as an exercise for students to identify the core mechanic and whether it is actually rendered well or further experiment with naming the key concept and procedural rhetoric in this genre. Again, as videogames go, these are some of the most boring but you can download part 1 and download part 2 if you want to see what a very basic scrolling shooter does. This is the game that I have been working on for two months now. 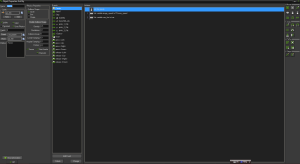 For now it is playable only in Windows, though it could be tested for any other interface available in GameMakerStudio Professional.On the left hand, you can see the opening window and next how it looks like when you work on it in GameMakerStudio Professional. 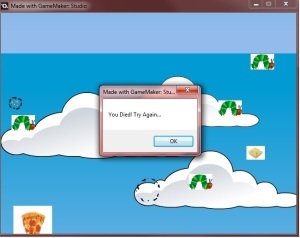 To begin with, I thought I was going to use Unity 2D to make my first simple 2D game. So, I started learning Unity 2D by taking this course and next, this one. Unity will basically enable you to make any 2D game you want, so I wanted to have a shot at it. However, this turned out to be too big a task for a total beginner because of the fair amount of scripting that one has to learn, so I returned to GameMakerStudio, Professional Edition and attempted to learn it on my own. Learning a new tool by doing and undoing your work constantly was not always a smooth process but definitely one that I would recommend. There is a lot to be said about making and breaking your own game. Finally, I returned to a more traditional learning process by taking another course with Alan Thorn via Udemy about how to build an old-school side scroller. 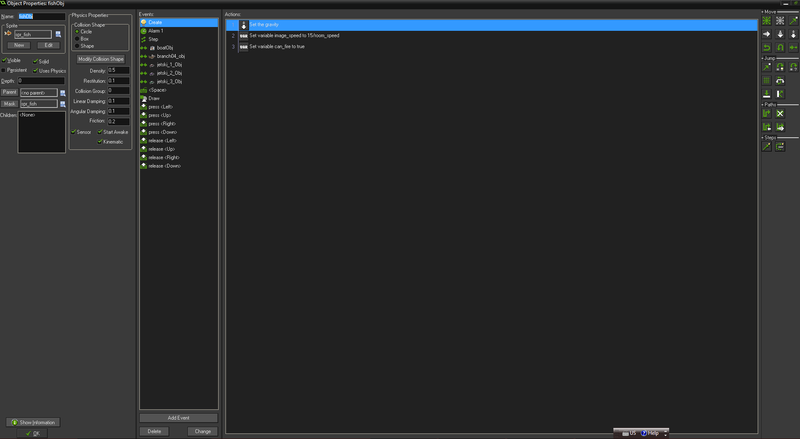 Eventually, I also learnt a bit about the scripting language that GameMaker uses and implemented it in the game. The idea for the game, given it is my first game was to experiment with simple mechanics type “Flappy Bird” and eventually gain some confidence that I could re-make this addictive, mind numbing game anytime if I wanted to. So, you will recognize some of this mechanics in “Fish Deputy”. Or, maybe you won’t. Then, of course, I wanted the game to have some personal touches whilst keeping it as simple as possible. From several readings on game design, I have learnt that it is more important than everything to finish your first game and then go ahead and make other games. So, I focused on keeping it simple. Here you can download what I called a Beta version of the game. Feel free to suggest improvements. 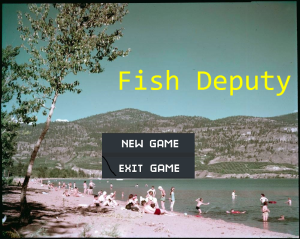 If you are interested in seeing a game concept overview, click on the Salon.io page I developed for “Fish Deputy”. Construct 2 is even easier to use than GameMakerStudio Professional and seems to have more support in the way of tutorials and workflows. Construct 2 comes with a really nice beginner level, free edition and the added benefit, if one is able to purchase a personal licence is a complete setup that allows exporting your work to multiple platforms. It turns out that this tool is not only capable of offering beginners a fantastic platform to experiment with 2D game making but it also allows one to tell a digital story. I have made such a story that relies on the use of the parallax effect to create layers, which I hope will spark a class discussion on ideology, representations, media heroes and villains, othering and much more. This story is speaking about the various layers of communism, its everyday heroes and its (un)/famous villains, real or imaginary and heavily mediated in popular culture. Using imagery connected to the fall of the Berlin Wall and its rendition in the media in movies like “Good-Bye, Lenin!” (2003) to visuals from popular media representing communism in some fashion, such as “Animal Farm” (1954), Rocky IV (1985), “Team America: World Police” (2004) and Miracle (2004), I hope to be able to unpack with my students several stereotypes, myths and ideographs that contribute to the formation of ideological positions. You can download the entire folder for this story here or view it via this link (please note that you need to have a browser that allows the viewing of HTML5 files in order to see the story). 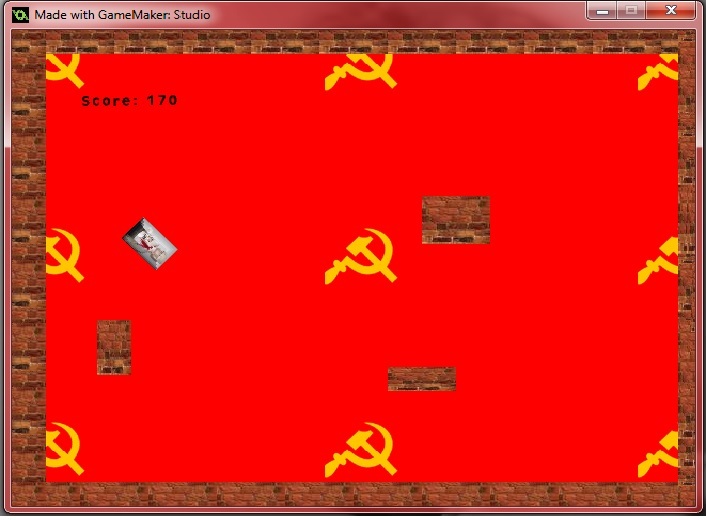 In order to see the story, click on the file “Layers of Communism.html” and upload it to your browser. On the left hand you can see how it looks in Construct 2 while I was working with the layers. 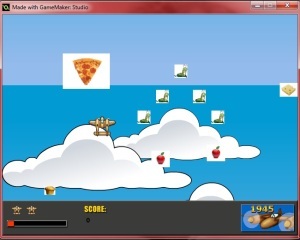 In the making of this story I have used three of the many tutorials available on Construct 2. They are a Beginner’s guide to Construct 2, How to make a Platform game and Parralax effect with 4 layers for Construct 2 Free edition. I look forward to building more 2D games using this tool and introducing it to students. For a quick idea of how this tool can be used in a university or college setup, please visit this link.